Traffic pollution causes genetic changes in the womb which increase a child's risk of developing asthma, research suggests. A study of umbilical cord blood from 56 children found "reprogramming" of a gene associated with exposure to compounds in traffic fumes. The gene was associated with asthma symptoms at age five, the researchers reported in the PLoS ONE journal. It is the first time pollution has been shown to influence genes, experts said. In the study, researchers looked at a gene called ACSL3, which is expressed in the lung. They also recorded the mothers' exposure to polycyclic aromatic hydrocarbons (PAHs) - a by-product of combustion present in high levels in heavy-traffic areas - during their pregnancy with backpack air monitors. The researchers found a significant association between chemical changes which control activation of the gene and high levels of maternal PAH exposure. Although the finding needs to be confirmed in larger studies, researchers say changes in the ACSL3 gene may be help early diagnosis of pollution-related asthma. It is an example of an epigenetic change - where environmental factors influence the activity of genes but do not cause structural changes or mutations in the genes. Previous work suggests the ACSL3 gene is involved in the structure of cell membranes. But more work is needed to unpick the role of the gene in asthma. Studies have suggested asthma risk is linked to environmental pollution in early life and the incidence of asthma is higher in areas with high traffic density. "Our data support the concept that environmental exposures can interact with genes during key developmental periods to trigger disease onset later in life, and that tissues are being reprogrammed to become abnormal later," said Dr Shuk-mei Ho, study leader and director of the Center for Environmental Genetics at the University of Cincinnati. 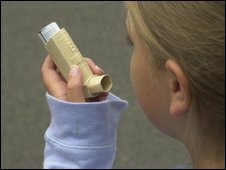 She said detecting early signs of asthma could help prevent the disease than can affect as many as 25% of children in areas with high levels of traffic pollution. Dr Keith Prowse, vice-president of the British Lung Foundation, said the study was interesting. "We know that children living in polluted areas have a higher incidence of asthma but what we didn't know was it was affecting a gene." "If you look at cord blood and you find the gene has been modified you know the child is more likely to get asthma so you can treat them early." He added there were probably many factors contributing to the development of asthma so the issue was fairly confused but in 10 years' time there would be a clearer picture. Dr Elaine Vickers, research relations manager at Asthma UK, said: 'We don't yet know whether air pollution can actually cause asthma and although this study is very interesting, further research is needed before we can say for sure. "We do know however that pollution triggers symptoms in two thirds of people with asthma, and many say that a reduction in air pollution would make the single biggest difference to their quality of life."